Quality is our mission: that’s why we behave most transparently with our customers, providing safe, accurate services. Our company provides a wide range of services: fast, on-time domestic shipments, international shipments by road, by sea and by air to and from over 350 destinations across the world, at competitive prices. Our inexpensive, reliable domestic and international shipments always have a tracking number, which helps keep track of your parcels while they are on their way to you. Our company’s services stand above the rest for perfectly optimised management of the entire process, for meeting customers’ requirements, for our wide range of services and for our ability to meet deadlines, so that we can really fulfil our customers’ most important need: fast shipping. Creating favourable conditions for providing fast, reliable service in an attempt to achieve our corporate goals through the principles of quality. Making sure all our customers’ shipments arrive in perfect condition, at a competitive price. Hiring and retaining competent and motivated people, valuing their efforts and their personal engagement, for the achievement of our goals. Our work focuses on promoting combined shipping systems to reduce the carbon footprint of road transport. 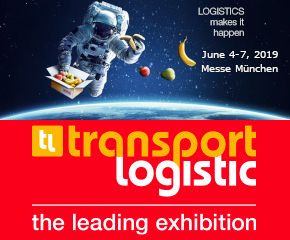 You are an international freight forwarder and want to meet us from 4 to 7 June in Messe München?